The Congenital Heart Defect Coalition (CHD Coalition) strongly believes in financial transparency of a nonprofit’s operational expenses. This helps a private donor or corporate sponsor to choose between similar nonprofit organizations. It also validates that funds are aligned to the nonprofit’s mission statement and are being used in the most effective manner. The CHD Coalition is operated and led by volunteers with no salaried employees within its national chapter or any subsidiary, which ensures that administrative expenses are kept as low as possible. The three main pillars of our mission are to unite and support the CHD community; increase public awareness; and advance lifesaving medical research. While each subsidiary is an independent chapter and can determine how to best service their local geography, the chapter must adhere to the mission pillars: community, awareness, and research. The CHD Coalition national organization oversees chapter operations and finances. The chart below highlights the Northern NJ National Chapter expense allocation. Approximately 26% of funds are used for community outreach, hospital programs, and scholarships. While our marketing expenses associated with awareness and education seem very low at 4%, this categorization is not an accurate representation of the impact that we truly have in promoting CHD awareness through our community and research activities. 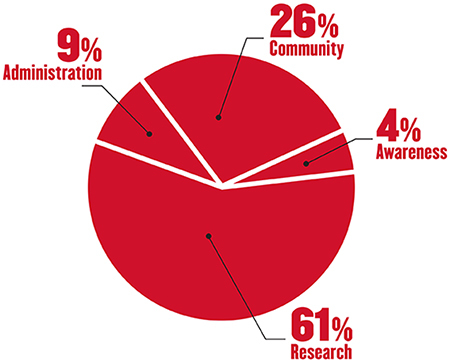 Year after year, over 61% of all funds received are used to advance CHD research and to continue research-related fundraising efforts. More details on our research grants can be found here. As previously stated, administrative expenses are kept as low as possible with an average of 9%. As we invest more into the various programs, the administrative overhead will continue to decline.